The battle cry against multidrug-resistant bacteria is loud and clear. Voices calling for novel antifungal agents are also rising, as fungi bolster the ranks of microbial infectious agents that are becoming increasingly drug resistant. Fungal infections are on the rise, many with lethal consequences. New proprietary research by BCC Research predicts that innovative antifungal drugs in development, along with a growing number of people with weakened immune systems and FDA fast-track provisions, are aiding growth in the global market for antifungal drugs. 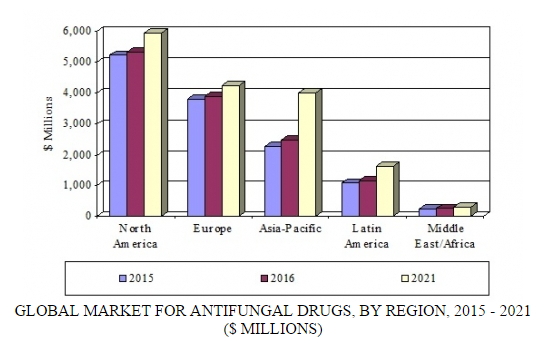 BCC Research expects the global market for antifungal drugs to reach $16.1 billion in 2021, up from $13.1 billion in 2016. Growth and development of the healthcare market and industry in the Asia-Pacific region has had a dramatic impact on the global market for antifungal drugs. Europe is currently the second largest market, but BCC Research expects it to have the lowest five-year compound annual growth rate (CAGR) of all regions. Its analysis determined that the Asia-Pacific region will exhibit the highest CAGR (9.9%) over the forecast period. The smallest market in terms of value is represented by the Middle East and Africa. BCC Research’s analysis revealed that systemic echinocandins represent the fastest-growing sub-segment of prescription antifungal drugs, whereas sales of systemic polyenes and systemic azole antifungal drugs have suffered from various patent expirations and subsequent generic substitutions for branded reference products. Between May 2013 and February 2017, 53 cases of C. auris were isolated in the United States alone, with the majority identified in New York and New Jersey, and nearly all taking place from April 2016 to February 2017. Most C. auris infections can be treated using antifungal drugs, but some patients exhibit strains resistant to these medications. According to the CDC Web site, treatment with multiple classes of these medications simultaneously and at relatively high doses sometimes proves successful. Data from a systematic analysis suggest that C. auris may be susceptible to an experimental oral drug. “This emerging fungal species has started to infect patients globally, causing invasive infections that are associated with a high death rate,” senior author Mahmoud Ghannoum, PhD, from the Center for Medical Mycology, Case Western Reserve University and University Hospitals Cleveland Medical Center, said in a news release. “It is multidrug resistant, and some strains isolated from patients are resistant to all commercially available antifungal drugs. Multidrug resistance used to be reported for bacteria only, and now we must add fungi to the list,” he continued. Emily Larkin and Christopher Hager, also from the Center for Medical Mycology, reported their findings from a study of C. auris characteristics, virulence factors, and antifungal sensitivity in the March issue of Antimicrobial Agents and Chemotherapy. The researchers also reported in vitro data showing that the new, orally bioavailable antifungal drug SCY-078 (Scynexis, Inc.) has potent activity against C. auris, including growth inhibition, antibiofilm activity, and inhibition of cell division. C. auris infection has an associated mortality rate approaching 60% and a propensity for evading diagnosis. The researchers studied 16 different isolates from patients in India, Japan, South Korea, and Germany. The study’s three main goals were to characterize the morphology and virulence factors of the isolates; assess the effectiveness of 11 drugs from different antifungal classes against each isolate; and evaluate the effect of SCY-078 on C. auris growth, ultrastructure, and ability to form biofilms. More than one-third of C. auris isolates were resistant to drugs from all three major classes of antifungals (azoles, polyenes, and echinocandins). However, SCY-078 had potent antifungal activity against all isolates tested in vitro. An antimicrobial protein caused a dramatic reduction in the lesions associated with oral thrush in a preclinical study, report microbiologists with McGovern Medical School at The University of Texas Health Science Center at Houston. They reported their findings in the Proceedings of the National Academy of Sciences. Oral thrush is a fungal infection of the mouth and throat that affects millions worldwide. “The long-term vision is to develop a new antifungal drug that takes a different approach to treating oral thrush,” said Danielle Garsin, PhD, the study’s co-principal investigator. Garsin and her collaborator, Michael Lorenz, PhD, tested the effectiveness of the antimicrobial protein (EntV) in a mouse model of oral thrush. Because this particular type of fungus, C. albicans, can develop resistance to medications over time, there will always be a need for new antifungals, Lorenz said. “While thrush is normally not a major problem for patients with normal immune systems, it can be particularly severe and difficult to treat in immunocompromised patients who have been exposed to multiple antifungals and can develop resistant strains of yeast,” said Luis Ostrosky-Zeichner, MD, director of the Laboratory of Mycology Research, professor of infectious diseases and vice-chair of medicine at McGovern Medical School. “Furthermore, development of new antifungals is encouraging in the face of emerging multidrug-resistant yeasts like C. auris,” said Ostrosky.